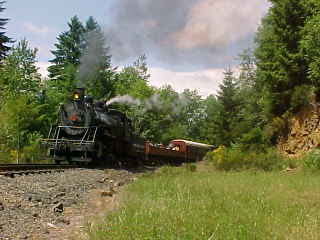 Our train today had Cowlitz, Chehalis & Cascade 2-8-2 15, a Baldwin Locomotive Works product, Open Car 801 Mount St. Helens and Coach 602 "City of Centralia", which was ex Union Pacific. 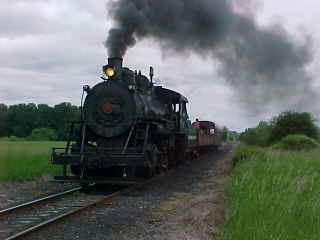 I stashed my bag on the train before walking down to the shop where I took a photograph of the back-up locomotive, ex. 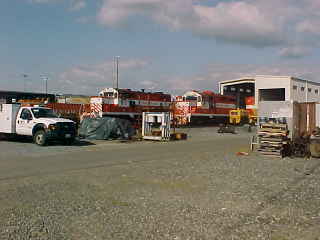 Puget Sound Naval Shipyard 9. 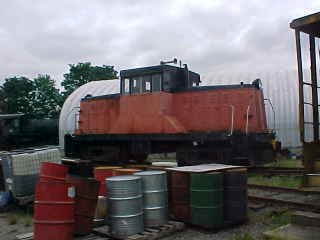 Our steam engine had been taken off the train to be watered. Another picture of the 15. 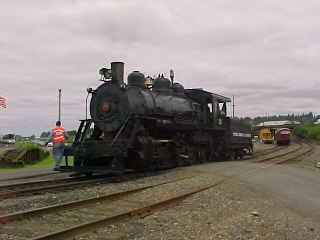 After being watered, the engine backed down to our train for the afternoon. 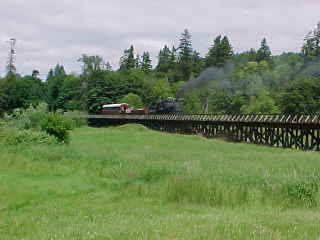 The Chehalis Western purchased trackage from the Milwaukee Road from Chehalis to Raymond in 1936 and operated it as non-common carrier Chehalis Western Railroad. 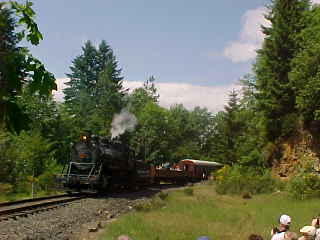 The line bought was 18 miles from Chehalis to Dryad. 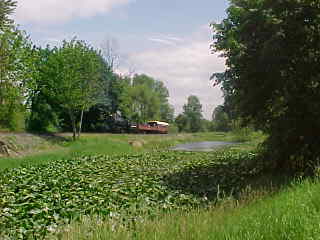 This line was not needed any more by the Milwaukee Road as it operated over a nearby Northern Pacific branch line. 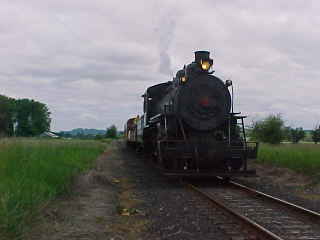 The Chehalis Western used only the first nine miles of this trackage from Chehalis to Ruth. 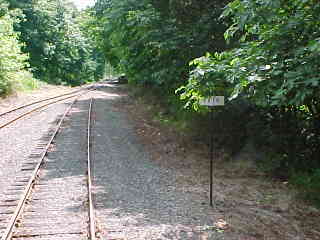 A new line was built south from Ruth to Camp McDonald to where timber was ready to be cut. 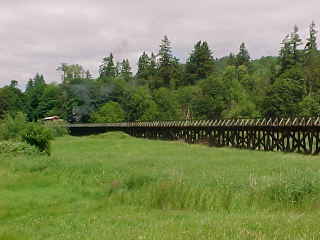 The logs would be taken from Camp McDonald to a log dump at South Bay near Olympia. 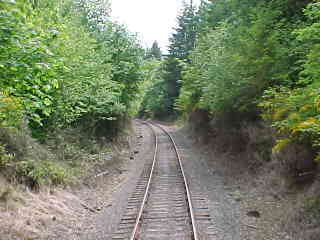 In late 1975 the line was cutback to Curtis where a log reload was built. 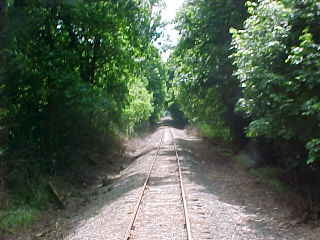 This truncated railroad was reorganized into the Curtis, Millburn and Eastern on December 1st, 1975. 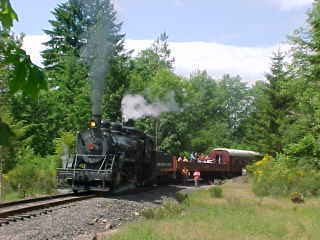 The logs were now taken from Curtis to Chehalis where they were handed over to the Milwaukee Road. When the Milwaukee Road abandoned all of its trackage west of Miles City, Montana, the Curtis, Millburn & Eastern Railroad was absorbed into a new Chehalis Western. 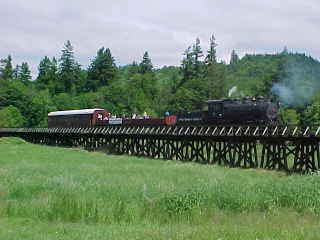 The former Milwaukee Road route to South Bay was taken over by the new Chehalis Western. 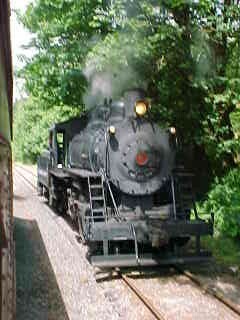 The Chehalis-Centralia Railroad Association was formed in 1986 as a nonprofit corporation. 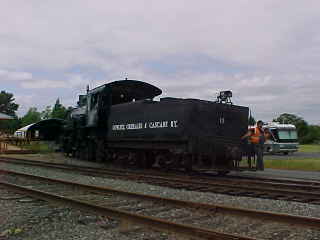 The founders were a group of local citizens whose goal was to restore a 1916 logging locomotive that had been placed in a Chehalis park thirty years earlier. 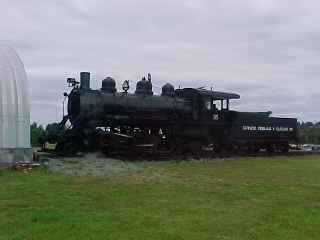 Early the following year, the restoration was begun and over the next two years, several railroad cars were acquired. 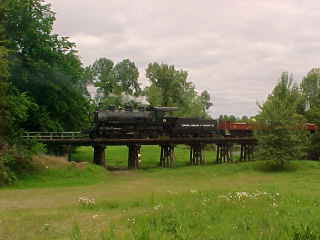 With restoration completed, scheduled operations began in the summer of 1989 over a section of former Milwaukee Road track in the Chehalis-Centralia area. 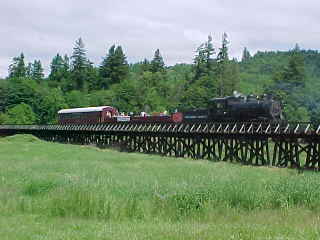 The Chehalis Western then shut down in 1992. 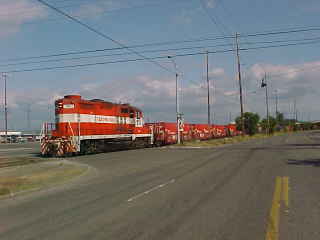 The entire line was sold to the City of Tacoma in 1995 and renamed the Tacoma Eastern Railroad. 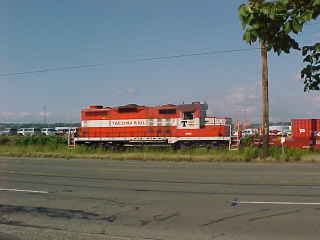 It lasted just three years when in 1998 the railroad was taken over by Tacoma Rail. With the engine now on the point of our train, I reboarded and enjoyed my Subway sandwich. 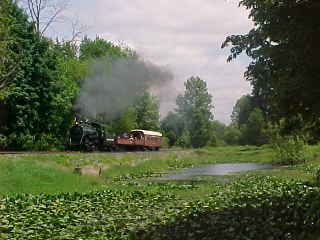 The train departed at 1:00 PM and headed west to the road crossing next to the Newaukum River for the first photo runby of the day. 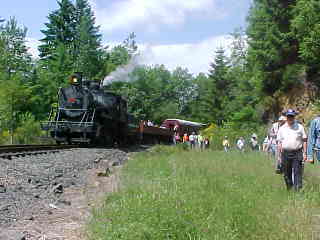 Train backing after Photo Runby 1. Another picture of the 15. 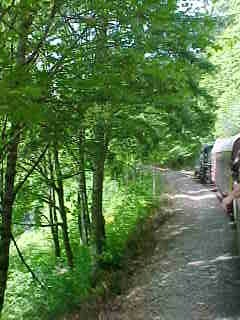 I rode out in the open car and enjoyed the conversations with my other passengers between Photo Runbys. 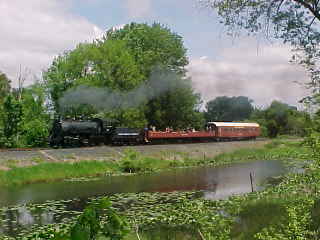 Just before Stearn Creek we stopped for Photo Runby 2. Here is the backing up shot. Photo Runby. 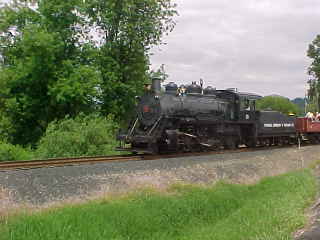 We all reboarded and continued onward then we went to Milepost 4.9, another grade crossing to unload for what I will call the "Lilly Pad Runby". 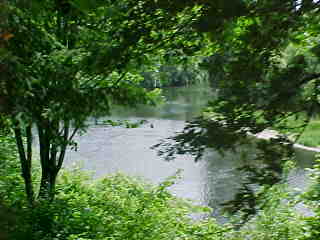 Photo Runby 3. After that it was decided to do another runby so I relocated to another spot. Photo Runby 4. 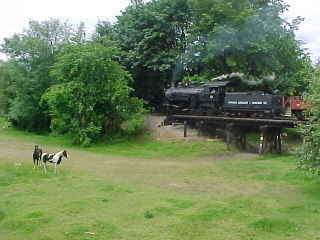 We reboarded and the train rolled onward towards Milburn. There I would start my new mileage today. 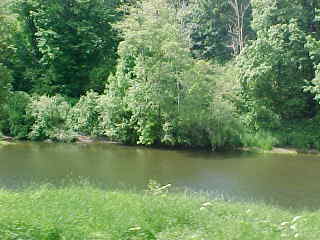 A short distance later, we came to an abandoned quarry where we stopped for the next Photo Runby. Here are the passengers unloading with Bob Riskie leading the way to the photo line. The static pose of our train. Photo Runby 5. 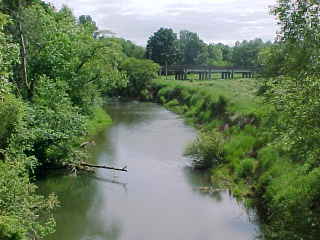 Once that was completed, we ran along the Chehalis River for a couple of miles on the way to Ruth. 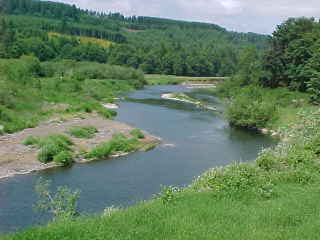 We passed the junction of the South Fork of the Chehalis River with the main Chehalis River. 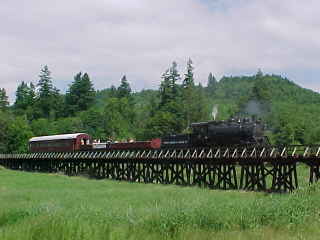 After we crossed the 1083 foot long wooden trestle over the South Fork of the Chehalis River we came to a stop at the red flag at Milepost 9.7, the end of our westbound run. Here we left some luggage. I never found out why! 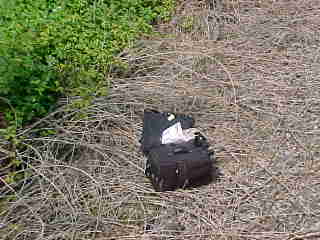 Unattended luggage maybe? Passengers then got off here and went to a waiting car as they only needed a one way trip. 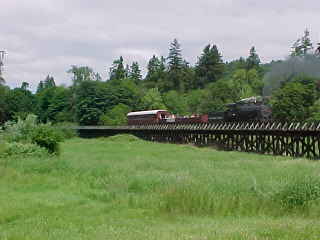 The train then backed to the west end of the South Fork of the Chehalis River Trestle where we all unloaded for our 6th and last Photo Runby of the trip. To get to my photo location, I had to walk through grass taller than me to reach a higher location in order to shoot over the grass. 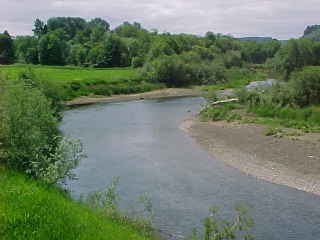 The South Fork of the Chehalis River. 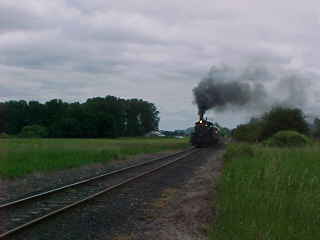 At Ruth, our engine ran around the train to pull us backwards to Chehalis. 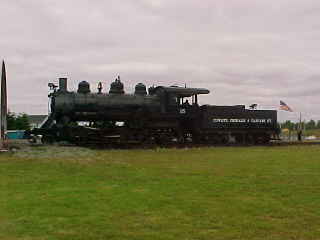 The Ruth Station Sign. Good conversations were had in the open car on the way back. 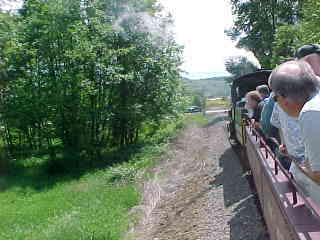 The view towards the front of our train. 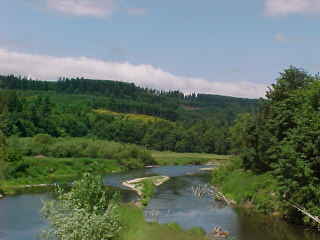 One last view of the Chehalis River for this trip. 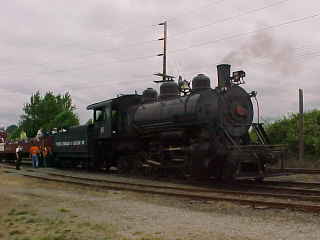 I took one last picture on this fantastic trip sponsored by the Southern Appalachia Railway Museum. I enjoyed many great conversations the whole way back to Chehalis, where this trip ended. We said our goodbyes before we drove north to Tacoma. 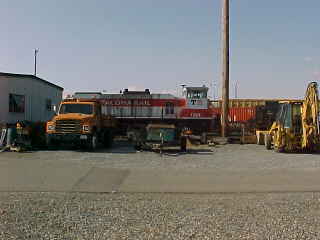 Once there we found the Tacoma Rail railyard. 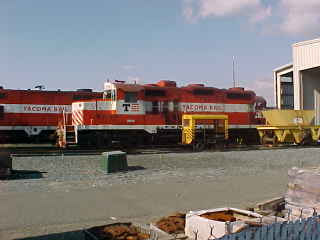 Motive power of Tacoma Rail. We caught a switch job at the west end of the yard. Next we drove to the Amtrak station where we purchased tickets for our Friday morning trip from Seattle. We had decided to take an early morning Sounder train from Tacoma to Seattle. The next stop was Freighthouse Square where a food court provided a chance for dinner. Of the four places we tried, only one was decent. 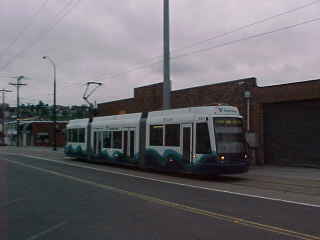 An after-dinner ride on the Tacoma Link Light Rail was next. 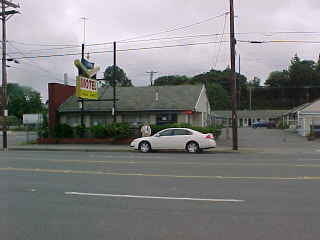 Jim and I checked into the Tacoma Dome Motel, a great location, but not recommended. Bob and Chris decided a Best Western would better suit their needs, so they got a room there. While they did that, I aired out our room and then relaxed for the rest of the night.